An ecovillage in Germany with 120 residents, a small ecological footprint, and creativity in design of its earth buildings. A german ecovillage with 60 residents and a variety of lifestyles, an example of an ecological paradise, especially for children. An ecovillage in Hungary with 150 residents, devoted to Krishna, with a very high level of self-sufficiency and a very small ecological footprint. 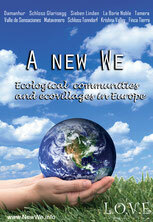 An Italian federation of eco-communities which altogether forms a network of about 1000 people. In Damanhur society's utopia is lived in daily reality. A community on the Bodensee in Switzerland, a seminar center for conscious being and living. A community in France that lives according to the ideals of Mahatma Gandhi, living close to nature with strong spirituality and high self-sufficiency. A Spanish eco-community that encourages life-restoring experiences in nature and emphasizes luxury, abundance and beauty. Formerly an abandoned mountain village in Spain, Matavenero was rebuilt through the Rainbow movement. Today it's an autonomous commune with 70 permanent residents. Tamera, the first Healing Biotope, is an international education and research center for the development of Peace Villages world-wide. Two hundred people live, work and study there in the south of Portugal. A tiny community in the Canary Islands that shows how beautiful, abundant and joyful a life close to nature can be.